Korea is a key location on the Eurasia plate margin. The strong desire and the capacity of the Korean geological communities to host the 37th International Geological Congress in Busan, Korea. A variety of geological excursions in both Korea and its neighboring countries within 1 hour flight from Busan. Unique programs to attract international participants including the‘Young Geologist Program’ and ‘Geological Film Festival’. Substantial support from local and central government agencies to ensure a successful hosting of 2024 IGC in Korea. Seongsan Ilchulbong Tuff Cone Natural Reserve is located at the eastern tip of Jeju-do, covering the entire area of Ilchulbong Peak and the coastal area. 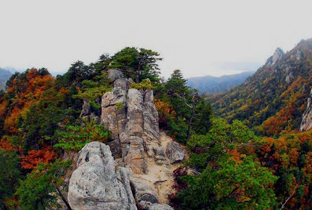 Ilchulbong Peak in Seongsan was formed in the middle of the Pleistocene when a volcano erupted under the shallow sea. The unique shape of the peak differs from other volcanoes since it is covered with big bowl-shaped, flat craters all over the island. The coastal area in Seongsanpo centering on Ilchulbong Peak is a blue belt, and the southeastern part in the area has wide beach consisting of rock area, gravel area, and sand area. With 127 species of algae discovered here, this place is also home to newly found marine plants, which draw attention from the world. A total of 177 species of marine animals were found, including many Korean-born undocumented species. Thus, it is very important in studying the distribution of marine animals in Korea. Seongsan Ilchulbong Tuff Cone Natural Reserve preserves its geographical, geological, and landscape characteristics, with the plant life in the surrounding 1 km area representing the marine life in Korea. This place is the home of newly found marine animals and plants, so it is designated and protected as a Natural Monument. The Yongmeori Coastline was formed when fragmental matter erupted from three volcanic craters in under the sea. Unlike the Seongsan Ilchulbong and Suwolbong Tuff Cones, it was formed while the craters were actually moving, giving it great geographical value. 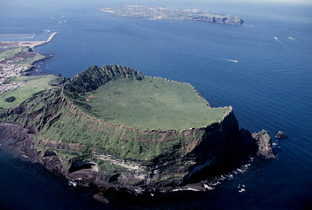 It includes the largest aqueous volcanic mountain in Jeju. The cliffs along the coast, formed by sedimentation and erosion over a long period of time, are said to resemble the head of a dragon. The coast has great landscape value. 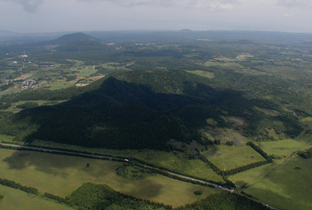 The Geomunoreum Volcanic Cone is one of the 368 parasitic cones distributed across Jeju Island. Located on the northeastern side of Jeju at a height of 400m, it is surrounded by numerous caves and is significant as the source of a group of 20 lava caves (including Gimnyeonggul Cave and Manjanggul Cave) in the area, formed when lava from this volcanic edifice flowed down the slope to the coast in the northeasterly direction. In this group of caves are cave systems running in three directions. The first cave system starts at Geomun Oreum and stretches for 13km, almost in a straight line, to Dangcheomuldonggul Cave, encompassing Baengdwigul Cave, Manjanggul Cave, and Gimnyeongsagul Cave. 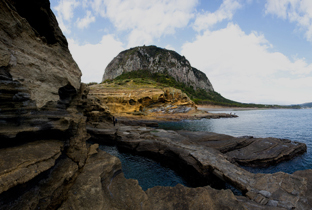 A study of the Natural Heritage District of Jejudo Island has found that the lava caves around Geomun Oreum in Seonheul-ri are of world standard in terms of scale, length, and cave organisms. In light of its value for research and as natural heritage, this site was nominated for UNESCO Natural Heritage listing. 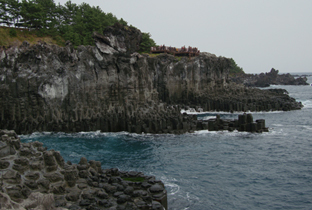 Columnar Joint can be found along a 3.5km stretch of the Jungmun and Daepo Coasts, Jeju. The surface of the volcanic rock is rough with clinkers, but the mid-section of the lava units, exposed through erosion, forms a beautiful line of points like a landscape painting. In terms of size, the bigger points are up to 20m high; from top to bottom, they are clean and varied in shape. Found along eroded sea cliffs, they are mostly upright, although some are horizontal. Their upper sections are square or hexagonal. Due to erosion, the exterior is well-exposed; since they are close together, they look like an elaborate work of sculpture. 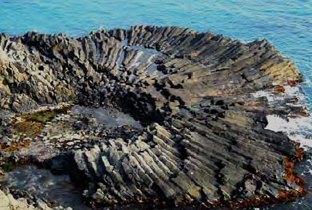 The Columnar Joint along Jungmun and Daepo Coasts, Jeju is important geological features enabling the study and observation of the results of basalt lava hardening and later development of the coastal topography through erosion. Therefore, this area is valuable for academic purposes and for its spectacular scenery. The Columnar Joint in Yangnam, Gyeongju, has earned recognition for excellence in terms of its scale and diverse shapes, features which differentiate it from columnar joints in other areas that have been designated as natural monuments. In particular, the horizontal joints are well developed in this zone, and include a fan-shaped one. It is regarded as a valuable material for studies and education on the cooling process and characteristics of volcanic rock, and constitutes a useful academic resource for understanding the formation process of the East Sea. The peaks of the Seoraksan Mountains break through the clouds while jade-like water flows through the valleys, creating breathtaking views and making this Korea’s most famous national park. Due to the many rare species found here, UNESCO designated this national park a Biosphere Preservation District in 1982. The mountain range located here stretches over an area of 373 ㎞² with the highest peak reaching 1,708 meters. Fossil site of dinosaur eggs in Gojeong-ri, Hwaseong was formed in the Cretaceous Period of the Mesozoic era. This place was an Island before the Sihwaho Land was reclaimed. 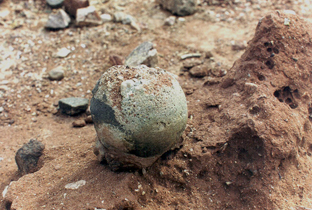 Fossilized dinosaur eggs were mostly found in China and Mongolia, but only a few sites had as many dinosaur egg fossils as the site in the Sihwaho Reclaimed Land. In the fossil site, 5 - 12 fossilized eggs were discovered in each nest measuring 0.25 ? 0.36 square meters. The fossilized eggs are oval, and their diameters are 11 - 12 centimeters. To date, 180 fossilized eggs have been found, and more fossilized eggs are expected to be discovered in the area covered with slime. With fossilized eggs of dinosaurs found in various drifts, experts presume that this Area was the main habitat of dinosaurs about a billion years ago. The fossils of extinct creatures are in good preserving condition. The place is very valuable for not only the habitat of dinosaurs but also as data of environmental and ecological research. Therefore, this place has been designated and conserved as a Natural Monument.